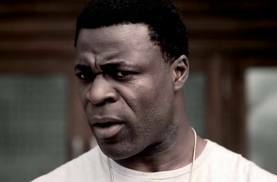 London born, Ghanaian heritage, Danny Sapani first discovered a love for the theatre at WAC - the Performing Arts and Media College in Hampstead, North London. The institution's alumni include the late Amy Winehouse. Sapani didn’t rest at that; he transformed youthful enthusiasm into full-time training at London's prestigious Central School of Speech and Drama. Since graduating almost two decades ago he has rarely been out of work. It’s a fact proven by the 40-something actor's impressive stage and screen resume. He has collaborated with acclaimed directors including Danny Boyle [Trance]; David Lann in August Wilson’s classic Joe Turner's Come and Gone; Max Stafford-Clark in the lead role for Macbeth and The Overwhelming; for Dominic Cooke in Tarell Alvin McCraney’s Wig Out; Paulette Randall in Radio Golf; for Nick Hytner in His Dark Materials; as well as Sam Mendes in To the Green Fields Beyond and Horace Ové in The Lion. I spoke with him recently during the rehearsals for his current gig in Errol John’s Caribbean classic Moon on a Rainbow Shawl, which is about to begin a run at The National Theatre’s Cottesloe. Sapani says he is excited to be working with Talawa Theatre’s newly appointed Artistic Director Michael Buffong - [Long Time No See; Unfinished Business; Brother to Brother], whose TV directing credits also include Holby City, EastEnders, Hollyoaks, Casualty and Doctors as well as stage productions such as Little Sweet Thing and the classic Lorraine Hansberry's plays A Raisin in the Sun. Describing his range of acting experiences and some of the directors he has collaborated with Sapani explained that: “I have worked with so many different directors and they all bring something different. I think Michael has a real eye for when something isn’t working; and he has got a way about him. [He] is an absolute master in the rehearsal room so there is no doubt we will have a great piece of theatre to watch”. Like many of his Black British contemporaries, Sapani has done the actors’ bread and butter parts on television in programmes such as Holby City and The Bill. He has also worked with Ross Kemp in Ultimate Force and has appeared in Channel Four's hit Misfits. Sapani is probably best renowned for playing strong and powerful characters, and he is as adept with Shakespearian classics as he is with the contemporary works of exceptional writers. Written in 1953 by the late Trinidadian writer Errol John, Moon Over a Rainbow Shawl is set in Errol’s native Trinidad. The play depicts the vibrant, cosmopolitan post Second World War Port-of-Spain that nourished the development of Trinidad and Tobago's contemporary culture. Born in Trinidad in 1924 Errol John began his career as an artist and journalist. He travelled to England in the post War period where he enjoyed some success writing and acting in the 1950s and 1960s on British TV and stage productions but couldn’t translate this experience to break Hollywood, where his most noted roles were in small parts, the most famous being a Sidney Poitier vehicle Buck and the Preacher. Moon Over a Rainbow Shawl was the winner of an influential Observer Play of the Year Award soon after its publication. And it was one of the first plays to fuse dialogue and script with Trinidad’s Creole dialect and formal English. Having played many diverse characters, Sapani says this fusion doesn't bother him. Responding to a question about the ensemble dealing with the distinct accent of the Land of Steel Pan commented: “It is very particular, the Trini accent! We are managing [and] some of that is covered by the writing. If you follow his structure - like any great wordsmith the rhythms of speech give an understanding of how [the plot and story] develops”. In Moon on a Rainbow Shawl Sapani - playing the role of Ephraim - will be on familiar territory. He’s already appeared at the National Theatre [The Overwhelming] and collaborated with co-star Jenny Jules [The Big White Fog]. So playing a part already made famous by the likes of James Earl Jones in an early 1960s production of the play and Talawa stalwart Victor Romero Evans, when the piece was reprised in the early part of the last decade - also by Talawa – is another big challenge for the actor. His character Ephraim - who sees his future in the Mother Country metropolis rather than the too-small-for-his-own-ambitions Caribbean - is strong, opinionated and dominant, but could just as easily induce an audience’s hostility. It’s a dream role for any actor but one that Sapani did not find daunting. “If you don’t feel sympathy for him then we haven’t done our job [properly]”, he tells me authoritatively. Whilst the work of Errol John, who died in London 1988, may not be as well known as some of the classic works dramatising the African Diaspora’s experience, Danny Sapani is adamant that such writing stand as important pieces of drama for a modern audience which entertain as well as highlighting the issues of the past. The actor is convinced that the quality of the play and its writing is the most import thing, not the date when it was penned. “Although it was written in the 1950s it is still is relevant, not only in the sense that we are talking about the sacrifices that people make when they leave one place to go to another but also what affects us as a Diaspora. The questions that these characters are asking about their lives are not dissimilar to the questions we ourselves are asking”. And when he finishes this run of Moon on a Rainbow Shawl, like many in his profession, he hopes to continue extending his skills towards writing, something he has already got a taste for. BOX OFFICE +44 (0) 20 7452 3000.